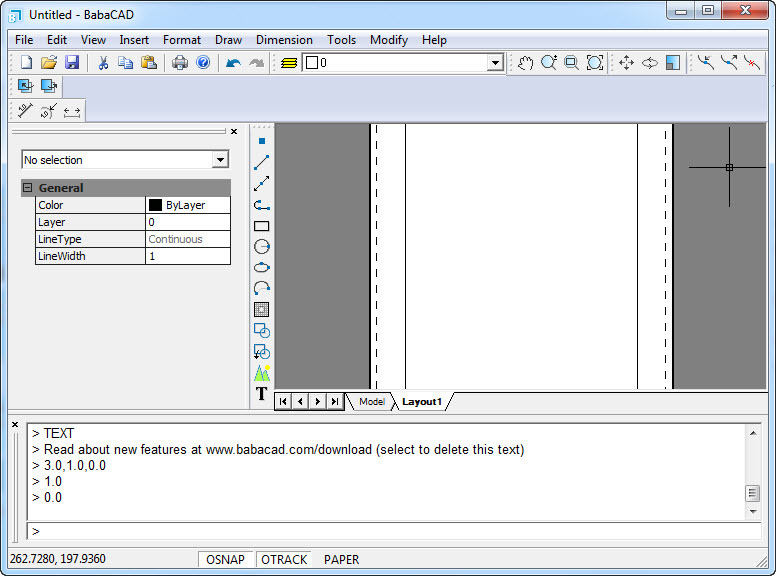 BabaCAD is a free CAD software for windows with DWG support. Supports standard CAD files (*.DWG, *.DXF). Organize and group objects with layers and blocks. Draw and modify 2D vector objects like point, line, rectangle, polyline with arc segments, circle, arc, hatch, text, block, dimension, image. Object snap (end-point, mid-point, intersection, nearest, perpendicular). Attach dimensioning to objects (ordinate, aligned). Undo/Redo up to 100 commands. Smart selection with left-to-right and right-to-left (smart touch). Modify commands: trim, extend, offset.. Plot with scale, layout and multiple viewport support. Use different colors, line types, line widths by block or by layer. Insert images of standard image formats (jpg, bmp, gif,…). Insert and manage georeferenced raster images (tif,tfw world file). OpenGL graphics used for rendering.